Jerez old town always dresses well for Christmas. This year the lights are somewhat more subdued, the Town Hall is economising – it’s austerity. Like every year, however, in this pre-Christmas period, the centre is a wonderful place to stroll after dark and lots of people do exactly that, anticipating the holiday to come. 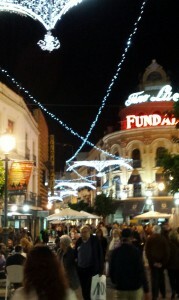 There are tasteful white lights along the Calle Larga, the main shopping street and the shops are, of course, open until nine o’clock in the evening. 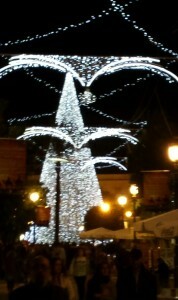 Calle Larga leads up to Arenal, one of the city’s main squares, where a large modern Christmas tree sits, made entirely of lights. The orange trees which line the streets are also light-festooned, although their oranges have been removed, presumably for fear of electrical accidents. Even the narrow central streets have coloured lights strung across above the cobblestones. 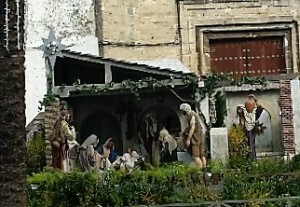 In the Alameda Christina, outside the monastery of Santo Domingo stands the town Nativity, a life-size depiction of stable, occupants and livestock. Time was when the animals would be real, donkeys, sheep, cattle and all. No longer. But there is a traditional Christmas market in Arenal which sells, among other things, the little plaster statuettes and figures with which to create a nativity scene. Many Jerez households set up their own nativity scenes at home and I can remember from childhood that many English households used to do the same. My neighbour, not someone whom I would consider especially religious, has a little display of delicate nativity figures in her otherwise modern flat. My Christmas card was placed, incongruously, next to it. The giving of cards at Christmas not being a Spanish tradition, it was the only one. I bought presents at the market – fresh local honey, books and dishes. When one stepped back from the stalls and looked up one saw another traditional aspect of Arenal, as a centre of protest. The Confederacion General del Trabajo, or CGT, has its offices there. The anarcho-syndicalist trade union represents approx. 80,000 workers, mostly in Spain, though it is especially strong in Catalonia and in transport-associated trades. When the ‘indignados’ protest began, back in 2009, when the Puerto del Sol and town squares all over Spain were occupied by protesters, it was in Arenal that the tents appeared. They stayed for months, but are no longer there, yet still one often sees people selling or distributing progressive literature there. The banners hung from the windows above the Christmas market, with its religious paraphernalia, proclaim ‘Macho Violence is Terrorism’ and ‘No human being is illegal’. 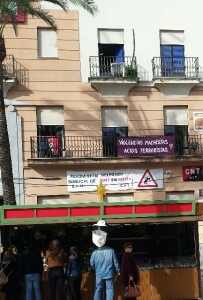 Religion and trade unionism seen together – in Spain that is a mixture which is highly combustible. The protesters will shortly have the opportunity to make their opinions known at the ballot box. Spain goes to the polls for a general election on 20th December. When I was there the postal votes were distributed and the political campaigns and the media covering them ratcheted up a gear. Watching the TV and reading the newspapers was interesting, with a vast amount of coverage being given to the two main parties, the PP and PSOE, and much less to Podemos and the Cuidadanos (especially on TV). Social media was trending a ‘merged’ photograph of Rajoy (leader of the PP) and Rivera (leader of the Cuidadanos), which pretty much summed up the position of the right ( though the Cuidadanos, or ‘Citizens’ party claims it is centrist ). In Jerez itself a Gademos/PSOE coalition governs. Like the UK election back in May, however, there are wild cards. In particular the Catalan independence parties, which are, it is predicted, going to take a huge chunk of the Catalan vote, rather as the Scottish Nationalists did in the UK. This is more likely, it is thought, to weaken PSOE and the left (see CGT above), just as happened in the UK. It’s very interesting. But I enjoyed other more traditional pleasures during my visit. 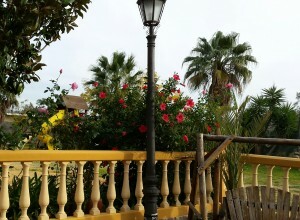 Lunch at an out-of-town Venta – at a table outside – was excellent ( the oleanders and roses were still in bloom, see picture, left, taken at the time ). And on Friday I went to see flamenco in a local bar. It was packed, but the audience was not disappointed by, among others, Gloria de Jerez (below). Unable to get a seat, however, we went on to Pantilla and stumbled into a local zambomba. More of which later. I have already booked my flights for February/March and the Festival de Jerez. Until then, the short clip below, taken at El Guittaron last Friday by a friend, will have to suffice. This was not the only music which I witnessed and, indeed, took part in, but that will have to await another blog. This entry was posted in Uncategorised and tagged Foreign field by juliej. Bookmark the permalink. Zambomba Julie, ending A… Regards form your local newsagent and Merry Xmas!!! Yes, I used the form ending in ‘a’ when I was there recently, but two different people corrected me and said it ended in an ‘o’. So I used that version. The version ending in ‘a’ is clearly the correct one ( as I would expect, you know what you’re talking about ). But clearly some folk have the wrong idea. Thanks for making me resolve this – it’s good to get it right. I’ll change the post.